aFrom the Departments of Radiation Oncology (S.B., C.M.G., J.C., J.M.Q., S.S.Y. )bRadiology (C.M.G. ), University of California, San Francisco, San Francisco, California. BACKGROUND AND PURPOSE: While standard guidelines assist in target delineation for head and neck radiation therapy planning, the complex anatomy, varying patterns of spread, unusual or advanced presentations, and high risk of treatment-related toxicities produce continuous interpretive challenges. In 2007, we instituted weekly treatment planning quality assurance rounds as a joint enterprise of head and neck radiation oncology and neuroradiology. Here we describe its impact on head and neck radiation therapy target delineation. MATERIALS AND METHODS: For 7 months, treatment planning quality assurance included 80 cases of definitive (48%) or postoperative (52%) head and neck radiation therapy. The planning CT and associated target volumes were reviewed in comparison with diagnostic imaging studies. Alterations were catalogued. RESULTS: Of the 80 cases, 44 (55%) were altered, and of these, 61% had clinically significant changes resulting in exclusion or inclusion of a distinct area or structure. Reasons for alteration included the following: gross or extant tumor, 26/44 (59%); elective or postoperative coverage, 25/44 (57%); lymph nodes, 13/44 (30%); bone, 7/44 (16%); skull base, 7/44 (16%); normal organs, 5/44 (11%); perineural, 3/44 (7%); distant metastasis, 2/44 (5%); and eye, 1/44 (2%). Gross tumor changes ranged from 0.5% to 133.64%, with a median change in volume of 5.95 mm3 (7.86%). Volumes were more likely to be increased (73%) than decreased (27%). CONCLUSIONS: A collaborative approach to head and neck treatment planning quality assurance has an impact. Cases likely to have challenging patterns of infiltrative, intracranial, nodal, orbital, or perineural spread warrant intensive imaging-based review in collaboration with a diagnostic neuroradiologist. Beginning in 2007, diagnostic neuroradiology participation was included as part of weekly HN treatment planning quality assurance (TPQA) rounds at our institution. The format includes diagnostic imaging review for new and follow-up patients, as well as the highly prioritized review of proposed radiation therapy target volumes and normal organ delineations, which are peer-reviewed by HN radiation oncology and neuroradiology physicians. As of June 2010, electronic documentation was prepared pre- and post-TPQA. 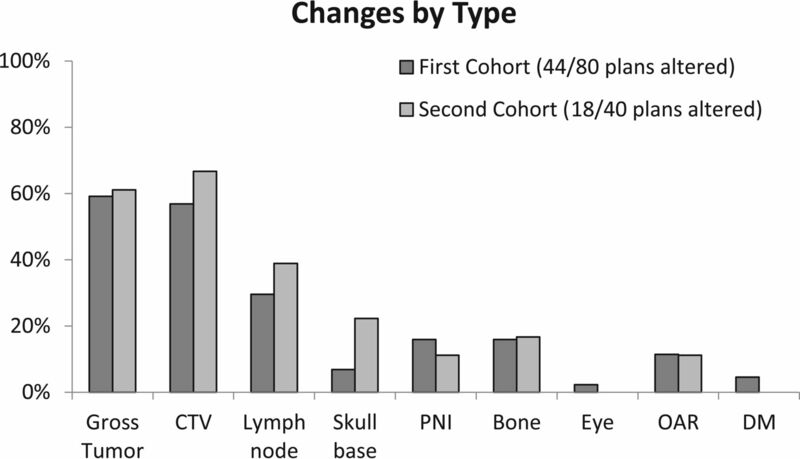 This study characterizes the impact of diagnostic neuroradiology involvement on the radiation therapy planning process. The HN TPQA team consists of radiation oncologists (including S.S.Y., J.M.Q. ); diagnostic neuroradiologists (including C.M.G. ); neuroradiology and radiation oncology students, residents, and fellows; and members of the dosimetry and physics teams (including J.C.). Review includes plans intended for treatment of the upper aerodigestive tract, and thyroid and HN soft-tissue and lymphatic and cutaneous regions. Pediatrics, spine, mediastinal, and lung cancer cases are occasionally reviewed, but these were excluded from this report. Figure 1 describes the treatment planning workflow. Treatment planning workflow for head and neck radiation oncology. Before TPQA, radiation planning CT scans are acquired with 3-mm section resolution; 1.5-mm section thickness is acquired for stereotactic cases. The planning CT is fused in multiple orientations with all available imaging studies, including MR imaging, diagnostic CT, and PET/CT. 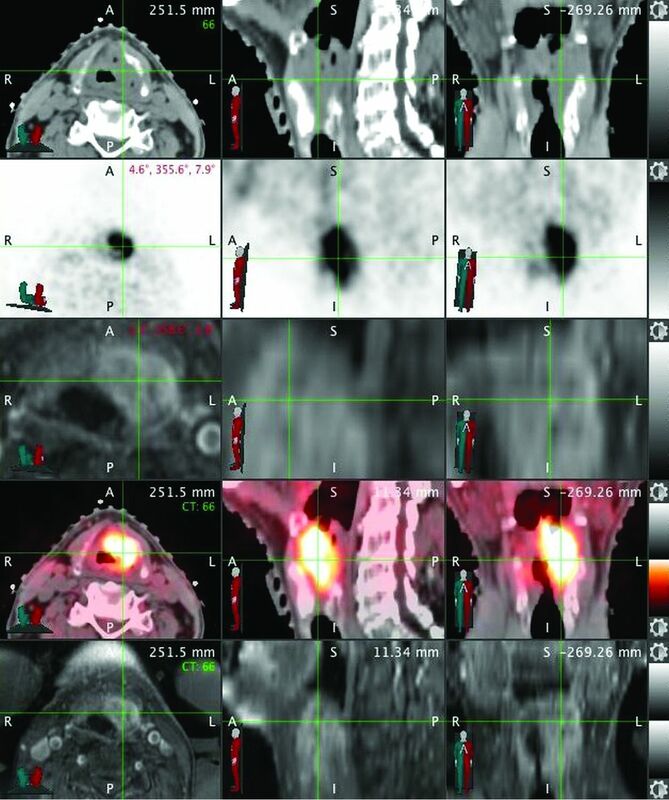 Target volumes and pertinent normal organ structures are delineated in advance by the radiation oncology team, reviewed and approved by the attending radiation oncologist who is designated by identifying first and last initials, and saved as a “Pre-TPQA” file. Per the International Commission on Radiation Units and Measurements report 50,7 targets are designated as gross tumor volume (GTV), which includes all gross tumor appreciated on clinical examinations or visualized on imaging; clinical tumor volume (CTV), denoting regions of clinical risk outside the GTV, which include both areas considered at highest risk for involvement (CTV1) and those considered at lesser risk such as prophylactically included elective nodal basins (CTV2); and planning target volume (PTV), which adds a small margin to each CTV to account for uncertainties of daily patient and machine setup. A dose range of 6000–7400 cGy is designated for the highest dose target and/or involved or high-risk nodal volumes (GTV, CTV1); and typically 4500–6000 cGy is designated for CTV2 (elective CTV). In the practice of our institution, CTV1 and CTV2 volumes are frequently subdivided (eg, CTV1 could be subdivided into CTV_6996 and CTV_6600, to clarify relative levels of highest risk by using the radiation dose as the suffix [given in units of centigray] and to enable “dose painting” when creating the radiation therapy plan). PTV volumes are created as a 2- to 3-mm expansion from the CTV; PTVs are prescribed at the dose of their corresponding CTVs and are used in the final development, optimization, and evaluation of the computerized radiation plan. Image fusion and delineations are usually performed on MIM (MIM Software, Cleveland, Ohio), though stereotactic cases are reviewed on a Multiplan (Accuray, Sunnyvale, California) station. Dosimetry is performed on Pinnacle (Phillips Healthcare, Best, the Netherlands), TomoTherapy (Accuray), or Multiplan systems. An example of image fusion is shown in Fig 2. Example of image fusion performed at TPQA. Green crosshairs intersect over the laryngeal tumor. Rows represent the following: radiation oncology treatment planning CT scan, diagnostic PET, diagnostic MR imaging, fusion of treatment planning CT with PET, and fusion of treatment planning CT with MR imaging. TPQA occurs at a workstation complex that includes juxtaposed Pinnacle, TomoTherapy, MIM, and PACS terminals, enabling a parallel display of all imaging and target delineation data. Following review of the clinical, surgical, and pathologic details of the case, the neuroradiologists review all available diagnostic imaging. Preliminary target volumes are then reviewed on the MIM, Pinnacle, or TomoTherapy station, superimposed on the radiation planning CT and all fused diagnostic imaging studies. This process is characterized by interactive discussion and repeat viewing of the diagnostic imaging. The primary focus is on delineation of gross disease and areas of high clinical risk but also includes consideration of sparing adjacent uninvolved and/or critical structures. Any proposed changes are carried out in consultation with the neuroradiologist. After collaborative target volumes are created, a postreview structure set is saved as “Post-TPQA.” A description of alterations is catalogued in the electronic medical record (MOSAIQ; Elekta, Stockholm, Sweden). Approval was granted for review of demographic and radiographic data by the Committee on Human Research. A primary set of 80 HN consecutive treatment plans was reviewed at TPQA from August 2010 to February 2011; this era was selected for study as quality assurance documentation was consistent by this time point and it was approximately at the midpoint of our quality assurance experience. Descriptive information regarding the type of change by anatomic compartment was documented at the time of review. Volumetric information was later quantitatively compared between the Pre-TPQA and Post-TPQA files. Alterations in major disease-related targets (GTVs, CTVs) and anatomic compartments (soft tissue, lymph nodes, perineural invasion, bone invasion) were recorded. The significance of the frequency and volume of change among HN subsites was analyzed by χ2 contingency analysis and 1-tailed analysis of variance, respectively. To rule out the presence of a “learning curve,” we similarly reviewed a second set of 40 HN consecutive treatment plans (August 2011 to November 2011). A 2-tailed Fisher exact test was used to compare the extent of target changes between the 2 sets. Demographic and histopathologic information for the 80 consecutive cases is presented in Table 1. Patient median age was 49 years (range, 29–89 years). Predominant subsites included the oral cavity (24%), oropharynx (18%), sinonasal region (11%), and nasopharynx (10%). Additional subsites were skin (9%), salivary gland (9%), hypopharynx (6%), and larynx (5%). “Other” (9%) subsites included the orbit, lacrimal gland, maxilla, and neck (Table 1). Squamous cell carcinoma was the dominant histology (76%), followed by adenocarcinoma (5%) and lymphoma (4%). Other (15%) histologies included sarcoma, esthesioneuroblastoma, neuroendocrine and mucoepidermoid carcinoma, and ameloblastoma (Table 1). Most cases were advanced-stage (60% stage IV, 19% stage III). Forty-eight percent of patients had definitive radiation-based treatment, and 52% had adjuvant radiation therapy following surgery. Overall, 55% (44/80) of Pre-TPQA structure sets were changed. The frequency of changes across subsites is shown in Fig 3A, from the hypopharynx altered in 80% (4/5) of cases to “other” with 29% (2/7) altered. Alterations were considered “clinically significant” if they resulted in exclusion or inclusion of a distinct area or structure and would change the radiation therapy plan with potential impact on disease control or toxicity. Sixty-one percent of altered plans (34% of all cases) had clinically significant changes, as shown in Fig 3B. Thirty-two percent (26/80) of cases had changes in the GTV, and 31% (25/80) had changes in the elective CTV (Fig 3B). Only 10 of 44 altered cases (23%) had changes in both the GTV and elective CTV. Other changes included addition or subtraction of lymph nodes (16%, 13/80), delineation of perineural pathways of spread (4%, 3/80), or reassessment of cancerous bone invasion (9%, 7/80). Specific forms of perineural and bony/cartilaginous target volume alteration most frequently involved the inclusion or exclusion of branches of the trigeminal and facial cranial nerves and skull base perineural invasion, such as minor branches around the pterygopalatine fossa and cavernous sinus or Meckel cave, and fine editing of structures such as the clivus, mandible, sinuses, hyoid, laryngeal cartilages, and trachea. For postoperative cases, detailed editing was frequently performed around the areas of reconstruction and flap placement. Frequency and general categorization of types of changes were similar among definitive and postoperative patients. A, Alterations by subsite following HN TPQA. Light gray bars represent cases that were altered after review. Dark gray bars represent cases that were reviewed without subsequent alterations. Percentages to the right of the bars represent the fraction of cases with alterations. B, Types of treatment plan alterations. Light gray bars and data labels represent the percentage of total plans (n = 80) found to have changes by listed category. Dark gray bars represent the fraction of total plans with nonsignificant changes. PNI indicates perineural invasion; OAR, organs at risk; and DM, distant metastases. Note that x-axes were broken to reduce the width of the figure while maintaining a display of low and high values. GTV and elective CTV changes are presented in Table 2. For altered plans, the mean absolute volume change for GTV was 14.88 mm3 (19.75%), and for CTV, it was 14.63 mm3 (21.83%). As shown in Fig 4A, most changes were increases in GTV and elective CTV (approximately two-thirds of changed plans). As shown in Fig 4B, both GTV and CTV changes were heterogeneous, ranging from <1% to >100% (up to 275% for elective CTV changes). Furthermore, there was no difference by subsite in the frequency of overall (n = 80) volumetric changes in GTV or CTV (1-tailed ANOVA, P = .64 and P = .74, respectively). Examples of alterations are shown in Fig 5. A, Volumetric changes in Pre-TPQA plans compared with Post-TPQA. Overall direction of GTV and CTV change. B, Volumetric changes in Pre-TPQA plans compared with Post-TPQA. Percentage of volume changes by subsite. Treatment planning examples of TPQA changes. Red represents the pre-TPQA GTV or CTV1, and orange represents the altered post-TPQA GTV or CTV1. Yellow represents the pre-TPQA or CTV2, and blue represents the altered post-TPQA or CTV2. 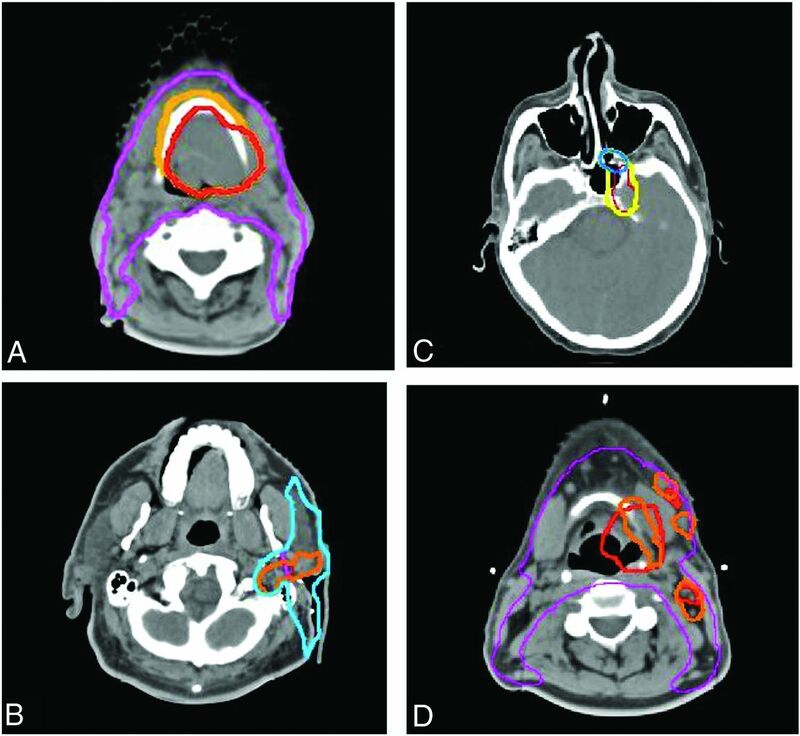 Changes include the following: increase in GTV for suspicion of gross disease involving the hyoid bone (A), increased GTV and CTV for pre-mastoid disease (B), expansion of CTV to include suspected PNI within the pterygopalatine fossa (C), and additional nodal GTV but decreased primary tumor GTV to spare additional laryngeal toxicity (D). PNI indicates perineural invasion. In the 40-patient follow-up set, the frequency of change remained stable at 45% (18/40) compared with 55% in the initial cohort (Fisher exact test, P = .34). As shown in Fig 6, the categorization of changes was extremely similar to that of the earlier cohort. Comparison of TPQA results from 2 different time points. There is an extremely similar frequency of types of changes in the initial cohort (n = 80) and the follow-up cohort a year later (n = 40). PNI indicates perineural invasion; OAR, organs at risk; and DM, distant metastases. In this report, approximately half of all radiation therapy plans were edited during neuroradiology-based peer review, and clinically significant changes were seen across all anatomic subsites and in both definitive and postoperative patients. The level of change averaged approximately 25% in volume but varied widely by patient, with reduction of target volumes (and presumably toxicity) in one-third of patients. Small GTV changes were sometimes highly clinically significant, especially for cases of lymph node involvement, osseous infiltration, or perineural extension. In postoperative patients, neuroradiologist input was valuable in identifying areas of close margin or routes of microscopic disease potentially underappreciated at the time of surgery. Because volumes at risk for microscopic disease were reviewed for all definitive and postoperative cases, the CTVs had a high frequency of change. These findings confirm the impact that neuroradiology-based peer review has on the delineation of HN radiation therapy target volumes. Previous studies of collaboration between subsite-specific radiation oncologists and radiologists have suggested similar findings. In 1 study, a panel reviewed tumor delineations of 10 patients with non-small cell lung cancer.8 The radiation oncologists' average GTVs were >33% larger and more heterogeneous, outcomes resulting from a lower level of proficiency in applying window settings, discriminating tumor from consolidation, identifying involved lymph nodes, recognizing partial volume effects, and identifying pleural and chest wall involvement.8,9 Similarly, Horan et al10 reported GTV delineation for 10 patients with cancer by a radiologist and 2 radiation oncologists. Two of 5 cases of HN cancer showed major discordance. Discrepancy was attributed to disparate access to clinical information and diagnostic imaging expertise. A follow-up prospective study of non-small cell lung cancer radiation therapy plans included a formal collaborative session to finalize target volumes.11 Changes occurred in 19 of 20 cases, with radiation oncologists reporting greater confidence in the resultant GTVs. Radiation oncologists collaborate with urologists in prostate brachytherapy delivery27 and with neurosurgeons in designing stereotactic radiosurgery for the brain.28 However, while the benefits of collaboration with diagnostic radiology have been promoted for both external beam8 and brachytherapy29 treatment planning, there is little evidence of formal inclusion in these spheres.9 Cited barriers include distinct workflows, separate locations, independent computer systems, and lack of defined billing mechanisms.30 Nonetheless, rigorously reviewed treatment planning is an essential component of care for patients with HN cancer because salvage options after inadequate radiation therapy are limited. Our experience documents the impact of collaboration across these formidable logistical barriers. There are limitations to this study. Because of uncertainty independent of the target delineation process (patient setup, machine-based physical uncertainties, multidirectional misalignments), CTVs are further expanded during radiation therapy planning to create planning treatment volumes (PTVs), which are used to design the final delivered plan and may suppress the effect of small changes in GTVs and CTVs.31,32 However, increasingly advanced radiation therapy delivery that decreases these uncertainties has led many practitioners to reduce PTV margins, amplifying the impact of small changes in tumor delineation.10 Furthermore, we designated clinically significant changes as those that would have resulted in omission or inclusion of an anatomically distinct area; this level of difference would not necessarily be remedied by PTV expansions. Another limitation may relate to the expectation of scheduled review, with the possibility that the radiation oncologists postponed decisions on difficult questions until TPQA, resulting in many changes. This phenomenon probably did occur to some extent, but we chose to incorporate these tendencies. Changes reflecting questioning or uncertainty are as important in their need for review as areas of unrecognized error. We believe these “gray areas” are better included than excluded from TPQA. Third, because of the fluid nature of TPQA, we could not isolate changes made at the discretion of the neuroradiologists versus those suggested by other participants. In fact, the presence of trainees often led to explanations of clinical insights with ramifications for target delineation. A less easily quantified value of TPQA is the educational and team-building function, which increases the capacities of the group as a whole across time. This is a by-product uniquely stemming from the involvement of neuroradiology in the target delineation process. Finally, it is possible that TPQA was evolutionary and the frequency of alterations changed with time. However, a review of cases from a later period yielded a similar frequency of changes, suggesting that the impact of the review did not diminish. Informally, we note that approximately half of our cases continue to be altered in some manner at TPQA rounds to this day. The intensity with which our process is conducted, in a concentrated, uninterrupted period of dedicated time each week, differentiates TPQA from informal arrangements and enabled a concrete documentation of the benefits of collaboration. At many high-volume HN programs, radiation oncologists may query a neuroradiologist about a specific aspect causing concern or confusion. In our TPQA process, neuroradiology is intricately involved in the inspection of targets through their superior-to-inferior extent by using comprehensive pre-prepared image fusion sets with targets overlaid on them. Inevitably, novel questions are raised by this convergence of information. Due to this sort of repeat exposure, our neuroradiology team is now experienced in the challenges of the radiation oncology decision-making process (because describing a tumor is not at all the same as drawing it), and they can understand and discuss the clinical trade-offs that are incurred related to specific targets of high- and low-dose prescription. The repeat synergy of experts at TPQA creates a network of knowledge that incorporates not only purely radiologic viewpoints but others that uniquely arise from the convergence of radiation therapy and radiology. While aspects of this level of teamwork may be replicated in ad hoc arrangements, we believe that structured interactions enabled this synergy at the highest level. Structured collaborative review of radiation therapy target delineation promotes the most effective use of diagnostic imaging in head and neck radiation oncology treatment planning. Interactions with diagnostic neuroradiology should be maximized, to promote a high level of treatment quality in the face of a proliferating array of complex imaging tools. Disclosures: Sue S. Yom—UNRELATED: Grants/Grants Pending: Genentech, National Comprehensive Cancer Network Foundation, Comments: funding for clinical trials*; Other: American Society for Radiation Oncology, Comments: honoraria for journal editorship. *Money paid to the institution. Paper previously presented in part at: Annual Meeting of the American Society of Radiation Oncology, October 2–6, 2011; Miami, Florida. Accepted after revision August 17, 2016.